Coming December 28th: Ride and Mingle, the Requel! Girlz Gone Riding 2013 Wrap Up! City of Fillmore Considering a Pump Track TONIGHT, November 12th! 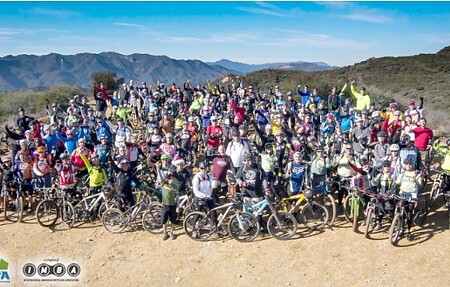 Last year CORBA staged the Ride and Mingle event at The Hub in Topanga State Park to celebrate our 25th anniversary. It was such a success that we’re going to do it again on December 28th! The Ride And Mingle (RAM) is to support and promote the ongoing efforts of CORBA’s programs. But most of all, it’s a chance to mingle with our members and do what we love most: RIDE! In celebration of its 26th anniversary, CORBA hopes to turn out at least 260 mountain bikers in a show of solidarity for mountain biking and responsible cycling. 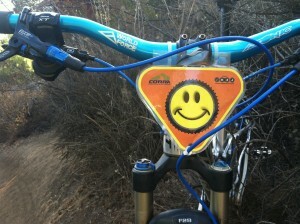 Ride in then meet at The Hub in Topanga State Park at 10am. There will be some cash prizes (yes, you can win CASH), but mostly it will be a chance for a photo opportunity and to mingle among our riding brethren. 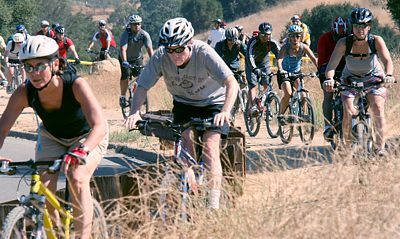 Riders are encouraged to ride from their local trail heads. Comments overheard at a public meeting got us to thinking that we need to show the land managers and open space trails community at large that responsible riders comprise the vast majority of mountain bikers. Unfortunately, a small percentage of people riding too fast at the wrong time is giving the off-road bicycling community at large a bad rap. The RAM will give mountain bikers a chance to show that we can and do coexist on trails. For directions to The Hub from multiple trailheads, visit our online registration page. In order to reduce the number of calendars we need to maintain and keep synchronized, we have started to use our Meetup.com calendar as the primary source of event information. The calendars displayed on our Home and Calendars page are still Google calendars, but they draw their data from Meetup. A quirk of this setup is that the calendars on corbamtb.com only display upcoming events. To see past events, it will be necessary to visit the Meetup calendar. Another side effect is that people who display the CORBA calendar on their website will need to update it to display the new calendar instead. January 25th, 2014: Backbone Trail from Latigo Canyon Road. 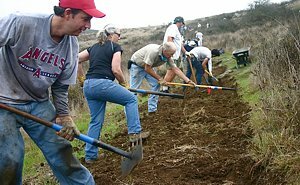 Join CORBA and the Santa Monica Mountains Trails Council as we return to the the Backbone Trail near Latigo Canyon Road. This time we’ll mostly be clearing brush along the 1.5 miles from the trailhead to Newton Motorway (AKA, The Saddle). We’ll also be touching up some of the drainage nicks we put in during our last visit here, and possibly adding a few more. For full details and to register, see our registration page. The City of of Los Angeles Recreation and Parks Department (RAP) is seeking public input on the future and funding of our City parks. This is being conducted through a series of public meetings, and an online Community Budget Discussion survey. The City has made remarkable progress on the implementation of the Bike Plan, at least where the Department of Transport is the lead agency. The five-year implementation strategy is ahead of schedule with regards to new bike lanes and other infrastructure supporting cycling on the City’s streets. Nothing has yet been done to implement the off-road cycling provisions identified in Chapter 4 of the 2010 Bike Plan. GGR has grown to over 450 members all starting from an idea at happy hour to get da girlz together! Wenches with Wrenches workshops started with full houses of eager women to learn bike repair and maintenance. This past GGR’s annual ROCKTOBER event and CORBA Membership drive was GGR’s 3rd annual main event with over 100 women in attendance again! The date is already secured for next year’s annual event! October 19th, 2014 at Malibu Creek State Park.